You normally begin with black and white imaging in podiatric and orthopedic ultrasound applications. And that gets the job done well enough. It makes guided injections possible, and you are able to perform exams of the plantar fascia and the Achiles tendon, view foreign bodies, measure ganglion cysts and other such pathologies. But there comes a point where you want to take your diagnostic exams to the next level. And that requires sharper imaging and greater control. Adding color Doppler to the mix only takes it yet another step further. The problem is, most color Doppler, high-resolution systems (particularly the portable ones) run over thirty grand. But that is all about to change. Enter the Q5. Finally premium color Doppler imaging and high-resolution musculoskeletal ultrasound capabilties ... at a price that makes sense. 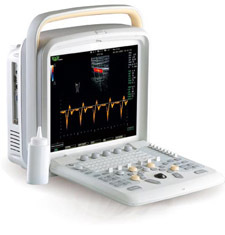 The CHISON Q5 is a portable color Doppler ultrasound system specifically configured for musculoskeletal applications and the diagnostic and procedural needs of podiatric and orthopedic practices. The Q5 delivers superb image quality across a wide range of applications, both in black and white and in color, and opens up an entire range of vascular procedures. The linear 4 - 13 MHz transducer offers the broadest frequency range in its class, and combined with the advanced imaging made possible through SRA (Speckle-Reduction), Compounding, Trapezoidal Expansion, Variable Speed, and Tissue Harmonics, the diagnostic capacities of the Q5 are truly extraordinary. The work flow on the Q5 has been refined specifically with musculoskeletal imaging in mind and is particularly effective for podiatry and orthopedic applications. 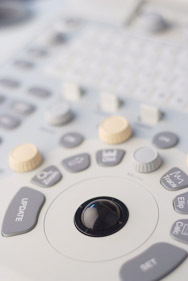 The 15-inch LCD display makes viewing your ultrasound image a delight. Custom presets make finding the best image quick and easy. The keyboard layout has been engineered for rapid adjustments, speeding along your exams. An entire arsenal of annotations makes placing notes on your image effortless. And saving images to USB (or sending them through DICOM to your network) takes no more than a few seconds. The ease of operation on the Q5 enables you to perform your ultrasound exams and procedures smoothly and effectively, so you can focus more on your patients. For musculoskeletal ultrasound work, you only really need black and white, and you don't especially need really high-resolution imaging. However, if you want to get serious with your diagnostic exams, and you want to be able to make fine distinctions and see things you wouldn't be able to see with less-robust systems, the Chison Q5 is going to be your best choice. You get all of the features normally only available on systems costing $35K, but at a price tag under $20K. And set up on financing, this is extremely affordable. Three ultrasound-guided injections per month will cover your entire investment. Simply performing two guided injections and two exams per day can have you earning $11,825 per month. And that's only two injections and two exams. About 12 minutes a day — to add about $140,000 a year to your practice. That's a great investment of your time, and an even better investment of your money. You can earn back 7X your investment on the ultrasound the first year alone. And all while bringing an incredible diagnostic and procedural tool to your practice, enabling you to give even better care to your patients. "An ultrasound is the most important diagnostic tool you are probably missing in your practice today." "Ultrasound is one of those tools ... once you have one, you won't be able to imagine how you ever got by without it." Click here to view a gallery of sample Q5 images. Click here to learn more about our podiatry ultrasound packages. We can help you set up your office with the Chison Q5 — on extremely easy, low payments. Call us at 800-839-0722 to discuss your financing options (and the absolutely extraordinary ROI you can expect to see after adding the Q5 to your practice).